You can have wireless AirPods charging right now, if you must. 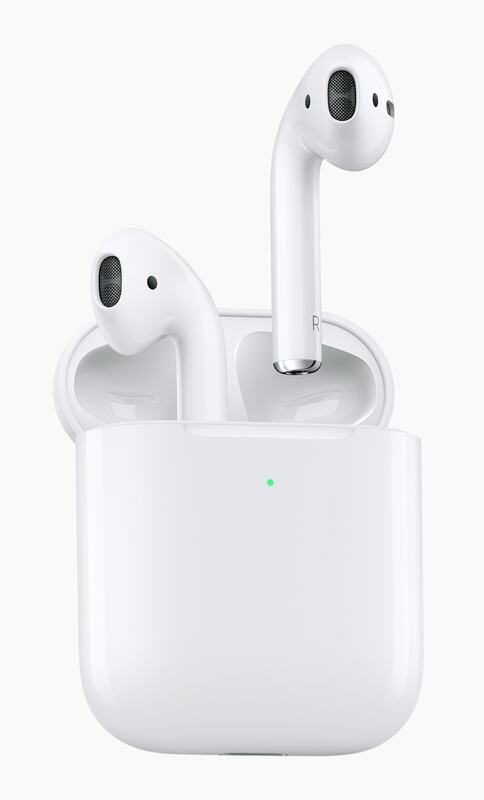 Dying to charge your AirPods wirelessly but hesitant to plunk down $79 for Apple’s new wireless charging case? If so, you might consider dropping $25 on a SliQ silicone cover for your AirPods case. It’s a relatively inexpensive way to add Qi wireless charging capability to your AirPods right now. But a variety of drawbacks should make you think twice. At this point, the wait for the AirPods wireless charging case that Apple launched this morning feels downright interminable. And we still don’t know when, or if, the AirPower charging mat will arrive. Apple promised us this gear back in 2017, but blew its self-imposed 2018 deadline for AirPower. If you’re happy with your first-gen AirPods, you can buy the wireless charging case alone for $79.99 and use it with them. Or you can save yourself half a yard and pick up that $25 SliQ wireless AirPods charging case. 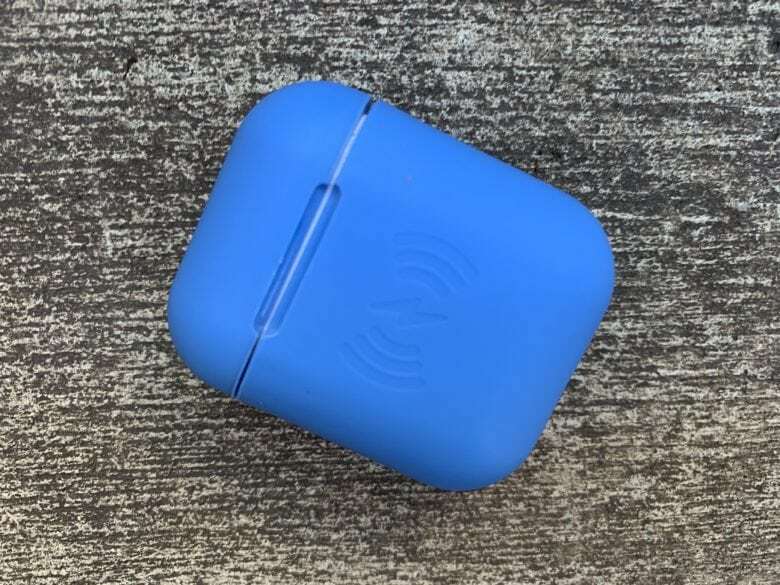 So, what do you get by skimping and opting for SliQ, an AirPods accessory sold by East Brooklyn Labs? A wireless AirPods charging case that cuts corners. 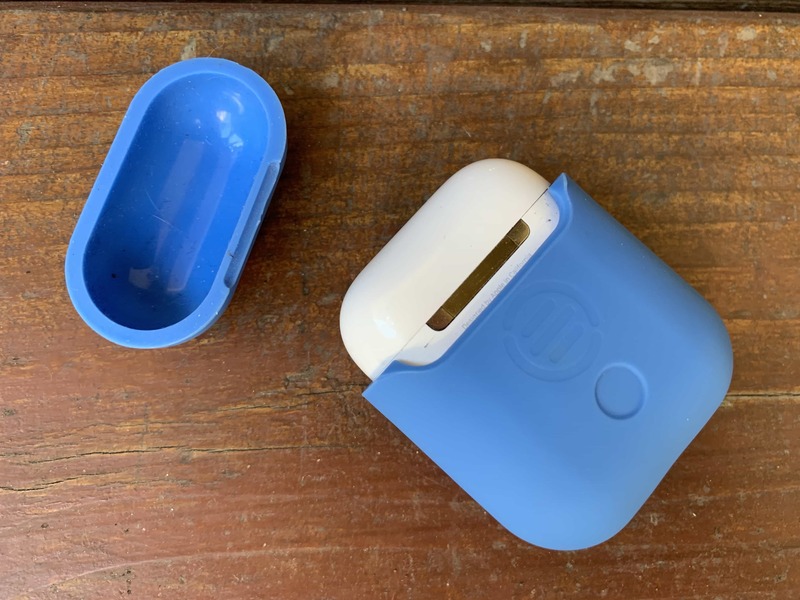 The two-piece silicone cover slides neatly over your existing AirPods case. The SliQ comes in four somewhat uninspiring colors (black, white, pink and the powderpuff blue I tested). The grippy silicone case fits relatively snugly — at least at first. (More on that later.) And, when you set your AirPods on a Qi charger, the wireless charging magic begins. At home, I use a perfectly fine mophie charging pad on my kitchen counter. It’s round and slightly larger in diameter than a common coffee mug. Putting an iPhone on the circular charger sometimes takes several attempts at lining things up properly to get the juice flowing. That’s bad enough. But placing my AirPods in the SliQ wireless charging case almost always takes multiple attempts to get things working. That often means 30 seconds or more of moving the case ever so slightly, trying to get the SliQ case’s blue indicator light to come on and tell me things are proceeding as planned. Trust me when I say that repeatedly repositioning an AirPods case does not mellow you out like spending time rearranging sand in a zen garden. By comparison, a Lightning cable takes about a half-second to plug in. Plus, if it’s connected to a fast charger, it will top off your AirPods case more quickly than a third-party wireless charging solution. In my totally unscientific testing, the SliQ wireless charger boosted AirPods from 0 percent to 37 percent in a half-hour, while the Lightning cable cranked them up from 0 percent to 45 percent in the same time. That’s not a huge difference, but it’s noticeable. Despite all the trash talk about “cable hell” and the fear-mongering about hunting for a Lightning cable, in this case staying wired is just simpler. And what if you want to switch back and forth? Once you’ve plunked your AirPods into a SliQ case, there’s no way to charge the device with a Lightning cable. 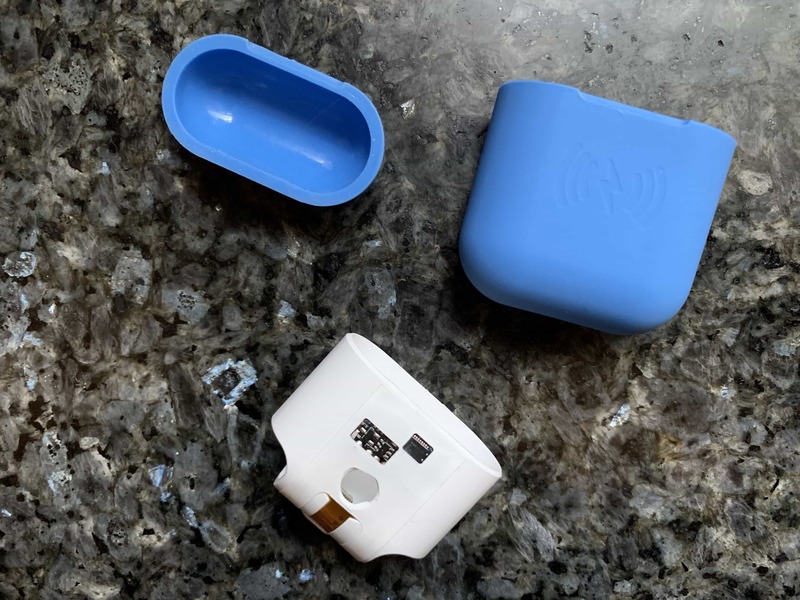 SliQ slides its own, hidden, eight-pin connector into the AirPods case’s Lightning port. The bottom of the SliQ case looks totally smooth. Now let me ask you: Do you travel with your AirPods? I do. Just like American Express, I wouldn’t leave home without them. But do you travel with a wireless charger? I don’t. When I’m on the road, I’m looking for the fastest charge possible. That usually means connecting to a power bank like the moshi IonSlim when there’s no outlet available. Back in my hotel room or in a cafe, I’m plugging in my iClever BoostCube for four ports of power. I’m typically charging several devices at once. I simply don’t need a Qi charger taking up additional space in my bag. This might change as wireless charging continues to gain ground, and Qi chargers become more ubiquitous in hotel rooms and cafes. But for now? Lightning cables actually seem like a more elegant solution to me. Whoopsie-daisy! Taking your AirPods case out of the SliQ silicone cover isn’t that easy. So, when I went on my last out-of-town trip, I had to take my AirPods out of the SliQ case so I could recharge them with a Lightning cable. Things didn’t go exactly as planned. It wasn’t all that difficult to remove the SliQ cover from my AirPods case. The top part came off easily. But I did struggle with the bottom part a bit. The plastic frame that holds the charging components seems delicate, and I didn’t want to break it. I also didn’t want to put too much stress on the hinge of the AirPods case. As I tried to slip the SliQ off, I inadvertently turned the case inside. This exposed the SliQ case’s surprisingly fragile-looking plastic inner frame and the internals necessary for Qi charging. Everything went back together fine (mostly). And it worked the same as always after I put it back together. That silicone top just doesn’t want to stay in place anymore. However, that slightly shocking development wasn’t the worst part about taking the AirPods out of the SliQ charging case. After putting the SliQ case back on, the silicone top never really reattached that firmly to my AirPods case. The SLiQ case definitely suffers from its two-piece design. It doesn’t look that great and, worse yet, the top really loosens up after you take it off for whatever reason. That leaves the top portion susceptible to falling off and potentially getting lost. Aesthetics aside, that really wouldn’t be the end of the world. The top part doesn’t have anything to do with the wireless charging mechanism. But using a SliQ case without the top part makes it look even less thrilling — and leaves the AirPods case unprotected in case of drops. Second-gen AirPods offer the option of Apple’s own wireless charging case. So, just how badly do you want wireless charging for your AirPods? And just how much are you willing to spend The SliQ case doesn’t cost that much and it works relatively well. But Apple’s case fixes one problem that SliQ doesn’t: It allows you to charge your AirPods either wirelessly or with that foolproof Lightning cable. To me, that freedom of choice is worth waiting for. I’d rather spend a little extra and get wireless AirPods charging done right.